Schedule your reusable bag donation pick up HERE. Recently we had an amazing visit with Christie Balch, Executive Director of Silver Spring Cares Partner, Crossroads Community Food Network which boasts an amazing Crossroads Farmers Market every Wednesday from 11 – 3. Haven’t been yet? Crossroads Farmers Market is a lively community gathering space for people of all backgrounds and incomes, where families, foodies, neighbors, gardeners, live-music fans, and coffee lovers meet every Wednesday afternoon to eat lunch and stock up on fresh ingredients for the week ahead. This producers-only market features a range of vendors selling fresh fruits, vegetables, eggs, honey, coffee, seed and nut snacks, Central American herbs like chipil ín, and tasty prepared foods, as well as food demos and tastings, kids’ activities, live music, and other events. 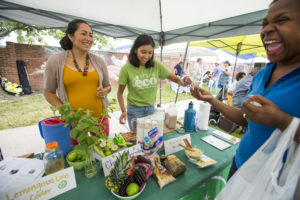 Crossroads was the first market in Maryland to accept federal nutrition benefits and the first in the country to launch a “double dollar” incentive program to match the value of these benefits spent at the market. Eligible shoppers are able to stretch their buying power to bring home more fresh fruits and vegetables, and at the same time support local farmers and vendors—three quarters of whom are immigrants themselves. If you’ve shopped in Takoma Park in the past year you likely noticed that The City of Takoma Park has banned the use of single-use, point of sale, plastic bags within the boundaries of the City of Takoma Park. Farmers Markets were exempt from this ban until December 2017. While compostable bags are acceptable to distribute, they cost 10 times that of the traditional plastic bag. It was clear that this was an opportunity for Silver Spring Cares! Perhaps you have tons of reusable bags lying around not being used. Now is the perfect time to cull your collection for a great cause! We’ll even come and pick them and deliver directly to the farmers to use in lieu of plastic! Everyone wins! Simply sign up HERE. On Friday, June 1st hang your bags on your front door and one of our volunteers will swing by to pick them up. Due to schedule and volunteer limitations we are only able to pick up from the following zip codes: 20901, 20902, 20903, 20904, 20905, 20906, 20910 and 20912. Want to volunteer to pick up bags or serve as a neighborhood drop off point? 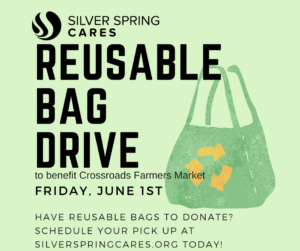 Let us know – email Heather@SilverSpringCares.org for more information. Thanks for helping make Silver Spring thrive!